At The Rust Store we believe in getting your product to you as quickly as possible. We use FedEx and the U.S. Postal Service for all of our shipments. We are located in Wisconsin; this central location is within 1 to 5 shipping days of the 48 contiguous states. All in-stock items ordered by 2:00 CT are shipped the same business day. Our fast turnaround of orders ensures that your products are delivered to you quickly. View our same day shipping guarantee. Please note: Some larger orders requiring freight shipment will require a freight quote, we will contact you with the shipping quote prior to shipment. We stock most of the merchandise we sell in our Madison, Wisconsin warehouse. In addition, a few of our items are shipped direct from the manufacturer. 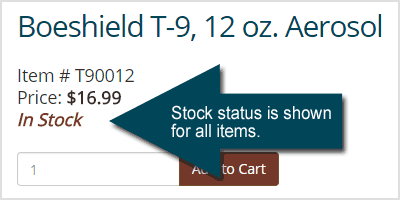 You will find the stock status of each product clearly displayed on the product page when you order along with any additional shipping information. We want your package to arrive on time and in good condition. Due to the nature of of many of our products (liquids, gels, powders), we take extra steps to ensure your product arrives in good order. We believe shipping and handling charges should be fair. We base our shipping and handling rates on the weight of your order. Our shipping charges to the 48 contiguous states start at $6.99. Many of the products that we ship are not allowed to be shipped by air. For this reason, air shipping may not be available for on all orders. Our website will can determine if you can ship an item by air and will give you an accurate quote. If you need expedited shipping, you can also call us at 1-877-256-9301 to determine if your product can be shipped via air and for a price quote. We also ship to Alaska, Hawaii, APO/FPO and US Territories, because these locations require air shipping, not all items can be shipped. Shipping outside of the United States is not available.